NASA’s MESSENGER probe successfully began orbiting Mercury earlier this month, and as a result some of the enduring mysteries associated with this planet may be solved in the near future. Insights gained by this mission could shed light on how planets were formed in our solar system. MESSENGER stands for MErcury Surface, Space ENvironment, GEochemistry and Ranging, which is NASA’s clever way to tie the mission to Mercury with the Roman messenger of the gods. Launched over six years ago, MESSENGER’s trip has included 15 orbits around the sun and flybys of Earth, Venus and Mercury in order to slingshot into position where, after a 15 minute burn of its main thruster to slow down, it finally settled into orbit on March 18, 2011. Mariner 10, the first and only other probe to approach Mercury, made three flybys from 1974 to 1975. Mariner was able to image 45% of the planet. It also unexpectedly discover that Mercury has a magnetic field. It is thought that planets generate magnetic fields because they have molten iron cores that spin quickly, but Mercury only rotates once every 59 day. Plus it’s so small that its core should have cooled off long ago. 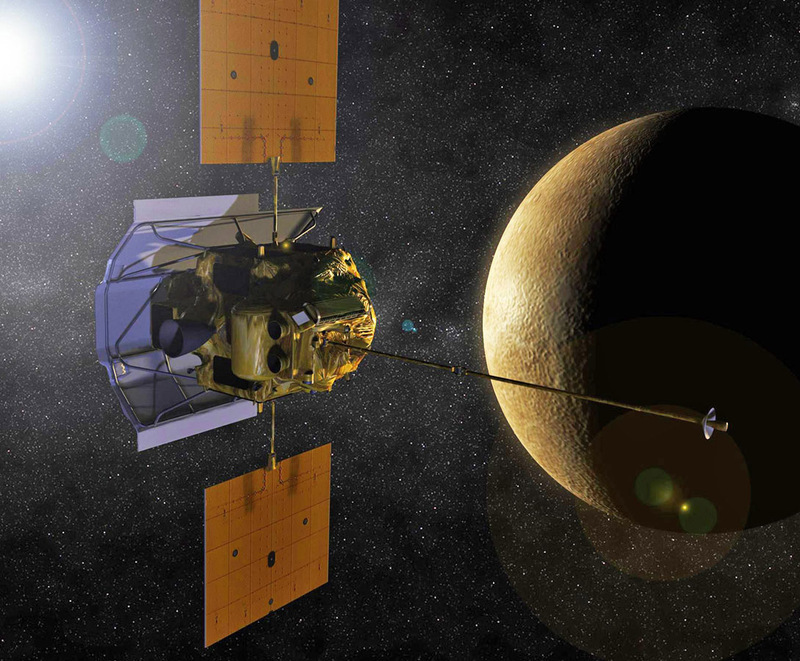 MESSENGER will analyze Mercury’s magnetic field which should yield insights about Mercury’s core. One thought is that Mercury’s core is shrinking as it slowly freezes. The planet’s surface is marked with mile-high cliffs that stretch for hundreds of miles and suggest that the planet is indeed shrinking. MESSENGER will look for more such evidence. Another mystery regarding Mercury’s core: why is it so large for such a small planet? Scientists believe that its iron core takes up about three fourths of the planets diameter, which is roughly twice that of Earth. Perhaps impacts over billions of years have stripped away Mercury’s surface, leaving only the inner mantle and core untouched. MESSENGER will analyze the planet’s geology which should shed some light on how it evolved. Temperatures on Mercury reach a blistering 425° C, yet at the poles there are deep craters that are permanently shielded from sunlight, and there might be ice deposits hidden away. If so, MESSENGER will be able to detect such an unlikely source of water, not unlike finding an ice cube in an oven. The probe will collect data for one year, and I will be publishing updates as this data gets interpreted and shared with the public. 1) True or false: Mercury has been thoroughly explored. 2) It is thought that planets need _______ to have a magnetic field. 4) Mile-high cliffs on Mercury are thought to be evidence that the planet is ______________. 5) The first probe to visit Mercury was ________________. This is really a knowledgeable post to know about the mercury. Students who participate in the science quiz can gain a lot of necessary information related to mercury, which helps them to solve any question related to this topic. Thanks for sharing this informative post.